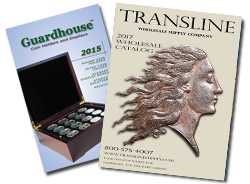 Transline Supply is constantly adding new products to our inventory. Browse below for some of our latest product releases to stock in your shop today. This 2018 annual page supplement for the H.E Harris Liberty I Album includes commemorative and regular issues released up to November 2018. Fits both 2-Post and 3-Ring Binders. Fits both 2-Post and 3-Ring Binders. This 2018 annual page supplement for the H.E Harris Plate Block Album includes commemorative and regular issues released up to November 30, 2018. All efforts were made to make this supplement as complete as possible at the time of printing. Any stamps not illustrated in this supplement will be included in the next Plate Block Supplement. Fits both 2-Post and 3-Ring Binders.